Mix Mandorla Delicata dough with egg whites by hand. Add a handful of culinary lavender. Shape as desired using a piping bag and medium sized nozzle on a baking paper lined tray. Bake in an oven set at 190oC for approximately 10 minutes, until golden brown. Melt white chocolate in a microwave. Add one drop of blue and two of red food colouring and mix until the chocolate becomes lilac in colour. When the biscuits have cooled, dip them into the white chocolate and place in a cool spot to set. 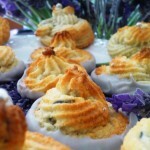 These biscuits are a real treat with an early grey or your favourite herbal tea.